your home for everything violin! Whether you’re 3 or 93, holding a violin properly is one of the first and most important things to get right! If your violin is not positioned correctly, your developing bow strokes and left-hand technique will be hindered. Just last week, I met with Rachael who was having trouble with her shifting. Rachael was very frustrated because, despite the hours that she was spending on shifting exercises, her moves to and from different positions were sounding rough. It turned out that an incorrect violin position was causing tightness in her left-hand and hence making it difficult for her to shift smoothly to higher positions. What size violin should I buy? As a parent, I try to save money wherever I can. I tend to shop for clothes that my children will get plenty of wear out of and therefore choose sizes that have plenty of ‘growing room’. Unfortunately, ‘growing room’ is not something we want in a violin, even if it does save us time or money or a combination of both! The first step to holding a violin properly is to have the right sized instrument. At my daughter’s last school concert, a group of five and six-year-old students struggled their way through busy busy stop stop. Many of them were hidden behind violins far too big for them which were no doubt doing irreparable damage, not only to their necks and backs but also to their technical development and progress. Choosing the right sized violin is crucial to holding a violin properly. The following table will give you an idea of the appropriate size violin for you or your child. When you reach under your violin as you stand in playing position, the scroll should rest comfortably in your palm and your middle fingers should wrap easily around the scroll. If you have to stretch or strain to reach the scroll, the violin is too big; your left-hand will need to be free and relaxed as you learn to play so don’t make this any harder or more uncomfortable than it already is by choosing an oversize instrument! Can I sit down to play? This is a question that I get asked at least once a week, even by my ongoing students who know that I’ll probably say no. While sitting may be appropriate for members of an orchestra or string group, it is not the ideal way to practice, especially as a beginner. As well as providing more comfort, standing properly to play will lead to more efficient technical development and allow you to better express your musicality later on down the track. Ensure that your body is balanced by distributing your weight evenly between your feet. Common problems with body stance include shifting your weight from one foot to the other, keeping your feet too close together and locking your knees in place. Not only do these things make it harder to play well, they can lead to pain or discomfort following your practice. For my little (and sometimes not so little) students, I use an A4 piece of coloured cardboard to make a ‘foot map’. Firstly, I trace around their feet in rest position and then again in playing position. This provides them with a guide to use every time they go to practice at home, it also provides a handy place to put reward stickers! Little people LOVE stickers and colours, so if you’re a parent or a teacher, a decorated foot mat is a perfect way to encourage practice and good technique! Don’t Forget To Stand Up Straight! I often tell my students to play to the sky as this encourages them to stand up straight. Slouching is bad for your back and can also cause problems with your bow position and violin hold. Keep your shoulders level and relaxed and if you ever do need to sit, for instance when rehearsing in a group, make sure that you sit firmly on the chair rather than hanging off the edge. Now that you’re standing straight and strong, it’s time to add the vital ingredient: a violin! One of my earliest memories is that of my first violin teacher chanting the words ‘toss, tuck, turn’ to me as she twisted my violin up and to the side of my shoulder. At the time, I don’t think I understood how much this simple routine would help my progress, but as a teacher, I see how my students benefit from first visualizing and then putting into practice these three important steps. The First step is to ‘toss’ your violin from the side of your body up onto your shoulder. You then ‘tuck’ the chin rest into place and ‘turn’ your violin to the side slightly. Here’s a video of five-year old George getting into the swing of things with his brand new Gliga! Well done George and thanks for being a part of myviolinbff.com! 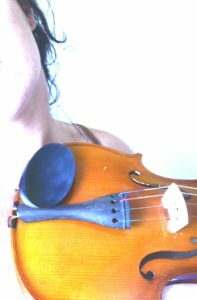 Once your violin is in the correct position, you’ll find that the distance between your collarbone and chin is the same distance between the bottom of your shoulder rest and the top of your chin rest; in other words, you won’t be either stretching or crumpling your neck to keep your violin in place. At this stage, you should be able to place both hands by your side and keep your violin up in position comfortably and safely. It’s important to spend some time focusing on your violin hold; just because you do it well the first few times doesn’t mean that you shouldn’t give it ongoing attention. Regular practice from rest to playing position in front of a full length mirror is a great way to pick up on any small errors in technique before they have the chance to become habits. Now that your violin is in the correct position, it’s time to add the bow! Check out my bow hold post here and if you ever need a hand with anything, be sure to let me know in the comment section below! Hi, this is something new for me to read, I don’t have enough knowledge about violin so I find this very informative. Thanks for the info. thanks for your comment and please do let me know if I can assist you with anything particular. Interesting, I did not know that a beginner violin player should practice standing instead of sitting. I guess there is a big difference between the two positions. I think standing is more conscientious than sitting. I have a question as well. When looking for a violin teacher, what would you recommend? For me, I know that I need rapport with my teacher if I am going to learn and grow well. Your thoughts will be well appreciated. Standing up when you play is much better for your posture and will lead to less back and neck pain no matter what your level. In terms of looking for a teacher; you definitely want to have a good rapport with your teacher but you also want someone who knows what they are doing and will not allow you to get away with bad habits in the early stages. Many people think that it’s harder to teach more advanced students. This couldn’t be further from the truth; setting up strong beginner technique is so vital and something that is often done poorly. Also remember that the perfect teacher for one person, won’t be the perfect teacher for everyone. I always meet with potential students before agreeing to take them as students. I need to see that we will make a good match and that what they are looking for is something that I can do well. I hope this helps, Alex. Hi Marketa, now that my daughter is in the school orchestra, she thinks it’s ok to sit down for all her practice. She’s quite advanced. Is this still a problem? Thank you in advance for your feedback. It’s really best if she stands up to play. When you sit, the tendency is to slouch or not hold your violin in a way that is supportive of strong technique. If she really insists on sitting, my advice would be to ensure it’s a hard wood chair and that she sits up tall and strong, not leaning on the back of the chair. I had no idea there was so much that went into playing a violin! My family has an old violin as a heirloom but I have always wanted to try my hand with it. After reading your post I feel more confident, so thank you! Do you have any further parting tips for a rookie? You might want to take the violin for a service before you give it a try. If it hasn’t been played for a while, it will probably need some new strings at the very least. Let me know if you need anything else and best of luck with the family heirloom! Hello Marketa. I’m looking forward to watching your video where George displays “toss, tuck, roll”! Will it be up soon? You do a beautiful job explaining these basics so that I can visualize these important tasks. I so appreciate conscientious teachers, like yourself, who take time to do it right! When shopping for a violin, do you think it’s imperative to stick with the professional sellers, because they should know what they are doing? Or, do you think it’s safe to buy from a private seller? I look forward to your valuable advice. Thanks for your message and for pointing out that I have yet to upload the video of George! I’m so sorry about that and will get onto it this weekend! Thanks also for your great feedback about the post; it’s always so nice to hear from people who are getting something out of the site. Thanks. Will do. Have a great day. Hi Marketa 🙂 I always wanted to play the violin. It’s one of my favorite instruments. You gave a lot of great tips that I would not have been aware of as a beginner with the violin. How expensive are the violins and the lessons too? Violin is one of my favourite instruments too! (although I think you may have guessed that). I’m so glad that my post has been helpful to you. Soon I’ll be adding some links to different violis; they really range in price. For a beginner instrument, you’re looking at around $200 (AU) for something lower end but you could spend any amount of money really. My eldest daughter’s violin is worth around $15,000. Lesson price depends on where you live. In Melbourne, Australia the prices range from $50 to around $150 per hour. Just remember that different teachers will be good for different students; I have many great students, some who have gone on to become professional violinists but I don’t take every student I meet. My teaching style aligns well with some students and not others. Don’t assume that the more you pay, the better your experience will be. I feel like the neck of my violin is really awkward and big. It’s a full-size violin that I bought on eBay a few weeks ago. Do you think it’s just me or could there be something wrong with the actual violin? I have a feeling that you have probably bought a bit of a lemon. A student of mine came back from their trip to China all excited with a violin they’d bought for the equivalent of $15.00 (AU). The violin was un-playable; it would have done more harm than good for him to use this instrument. If you think it’s worth it, take the violin to a luthier, or even to a music shop and ask how much it would be to fix and what you’d need to have done. I’m guessing that the neck isn’t shaped properly and that the bridge is probably too high. Whatever you do, don’t start learning on this instrument as it may damage your technique. I hope this is helpful and please let me know if there’s anything else I can help you with. Could you please include a picture of your ‘foot map’. It sounds really clever but I’m just finding it a bit hard to visualize. I think my little boy would love one! Actually, my sister used to play the violin but it was many years ago ( I can only remember fragments of her playing her violin). One thing I do remember is the little sticker dots she sticks on her violin. They help to keep her aware of all the accurate spots to place her fingers. Is this one kind of ‘foot map’? I’ll take a picture of a foot map today and upload it. Your little boy would definitely love one! The stickers on the violin neck are a good idea but only if you aren’t able to hear where to put your fingers accurately. It’s important to train your ears so I like to wait a while before I add stickers for my students. I am looking to buy a violin for my little 5 year old cousin. She’s 5 but she’s quite tall for her age, which size violin do you think would be best for her? Take a look at that because it tells you the sizes required for different arm lengths. 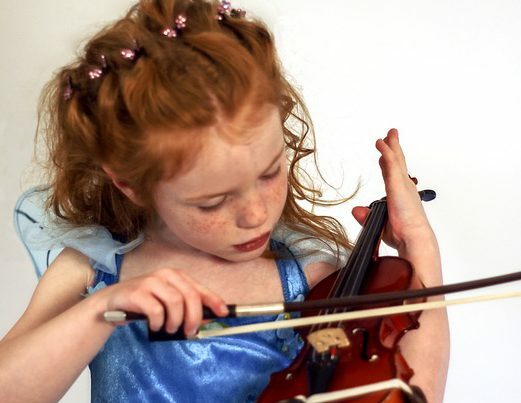 Best Age To Start Violin Lessons – Is Your Child Ready? Best Violin Shoulder Rests – Let’s Get Comfortable!